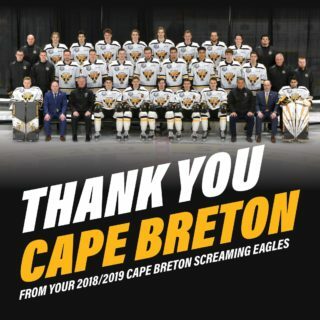 The final home stand before Christmas begins tonight for the Cape Breton Screaming Eagles as they play host to the Acadie-Bathurst Titan. The two teams coming into tonight’s game are trending in opposite directions: the Screaming Eagles are 7-0-1 in their last eight games, while the Titan have dropped four consecutive games. The Eagles find themselves tied for fifth (with RimouskI) in the competitive Eastern Conference. The Eagles have a record of 17-11-2 (8-6 at home), while the Titan are 5-22-1, which ties them for last in the QMJHL. The Titan have performed better on the road, with a record of a 4-8. ThIs season the Eagles have won two of three meetings between the two squads, splitting the two at home. 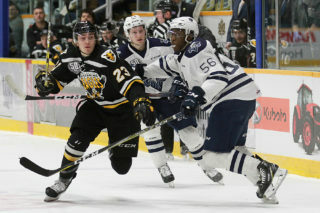 Cape Breton is coming off a 5-4 victory in Moncton on Wednesday, a game that saw Mitchell Balmas score the winning goal to cap a three point night. Balmas has points in nine straight games, tied for the longest current streak in the QMJHL. He’s also tied with Mathias Laferrière for 13th in the league in scoring. It’s a bit of a different looking Titan team since the last time they took on Cape Breton. Former Screaming Eagles coach Mario Durocher has taken over as head coach of Bathurst. During his current tenure he’s posted a record of 1-6. 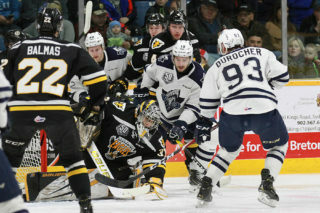 Durocher had also previously coached the Titan, as well as title winning teams in Victoriaville (2002) and Val-d’Or (2014). Despite their recent woes, Bathurst has received good goaltending in recent outings. 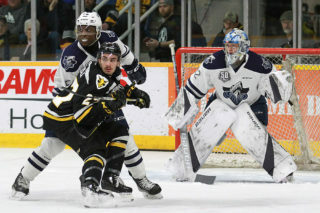 Backup netminder Tyriq Outen was the first star during a tight game against the Huskies on Sunday, and overage netminder Mark Grametbauer has posted a save percentage of .929 over his last four games. Tonight could mark the last appearance at Centre 200 of Noah Dobson, and almost certainly his final showing as a member of the Bathurst Titan. The first round draft pick of the New York Islanders will soon be leaving to attend Team Canada’s World Junior training camp, and has been heavily speculated in trade rumours for the upcoming QMJHL trade period.